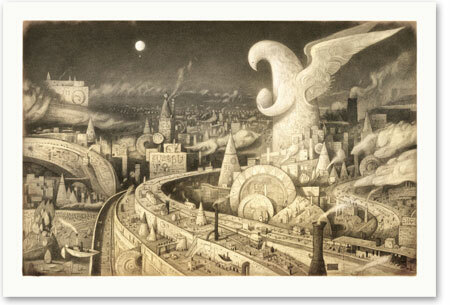 Shaun Tan is an acclaimed Children’s Book writer, Illustrator and ACADEMY AWARD winner for Best Animated Short for his film, The Lost Thing. He has also been a concept artist for films like Horton Hears a Who and Wall-E.
With such an enormous talent and many prestigious awards under his belt I take great pleasure in presenting some of his words of wisdom for new Illustrators here on our site for your enjoyment and fuel for your creativity and drive to succeed in this industry. Keep learning and getting better everyday!! You can check out the full Animated Short of the Academy Award winning, The Lost Thing at the end of the post. Illustration is a very diverse and scattered profession, a practice that takes many forms, sometimes even hard to define, and it’s very unlikely that the careers of any two illustrators are alike. It’s mostly freelance work where an illustrator moves from one opportunity to the next, often in an unpredictable way week to week and certainly unpredictable throughout a working lifetime. If nothing else, markets, technology, culture, personal skills and interests will change and develop all the time. That’s the first thing to be aware of, especially when either giving or receiving specific advice – every artist’s experience and circumstance is different. The most I can do it reflect on general principles gleaned from my own successes and failures over the years, tips that might be relatively universal, useful and, I hope, encouraging. Perhaps the first and most important tip is one that applies to all work: enjoy what you do, to the extent that it is a pleasure to go beyond the call of duty. Creating work that is more than sufficient, that exceeds expectations and even the demands of the client, has always been something that I’ve not only tried to do but learned to enjoy doing. I rarely consider any job “run-of-the-mill” or just “bread-and-butter” if I can help it. Given time and energy (admittedly not always available!) I like to treat every creative task as a unique experiment, and don’t always go for the easiest solution, or the one most dependent on existing skills. Every piece of work should involve an element of innovation or novel difficulty. This is what I’ve come to understand as “doing your best”: it’s really about trying to do a little better than your best. I’ve always been surprised at the results, and that in turn has fed my self-confidence as an illustrator. And, it’s also fun of course to keep doing different things, for our reach to exceed our grasp, something we know from our earliest childhood scribbles. It also explains my success as a creator of picture books. 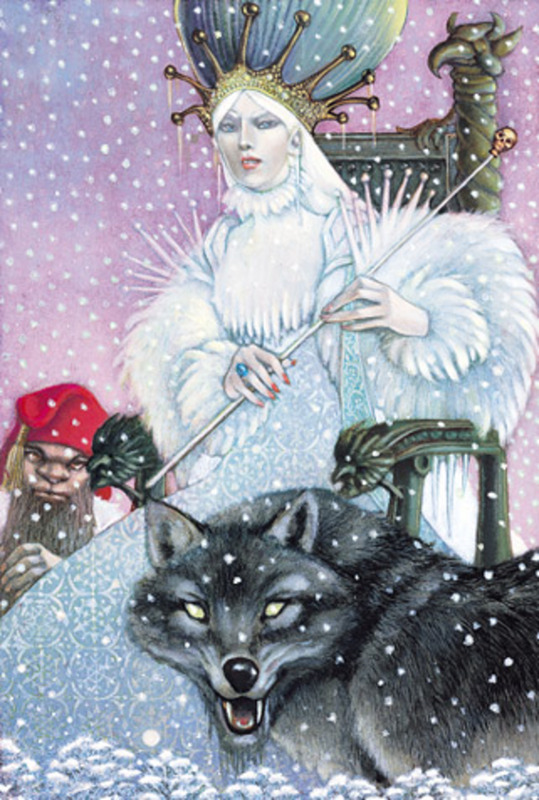 When I first entered the genre, I was very interested in challenging both myself and this the narrative form rather than executing good, safe and “appropriate” illustrations according to an agreed fee or royalty. I was inspired by other artists and writers with similar intentions, creating artistic problems for themselves, and investing seemingly unnecessary hours for very little pay, sometimes reaching only a small audience, in a genre that’s often critically overlooked and sometimes disrespected (true also of SF illustration from a mainstream viewpoint). That didn’t matter: what most concerned me was the opportunity for some experimentation that may not have been possible at the bigger commercial end of the spectrum, where higher pay usually equals less creative freedom. For the same reason, I devoted most of my energy and passion early in my career to small-press science fiction, because it offered the best opportunity for artistic development, weird visual challenges, and ultimately came to be the place where could I fine-tuned my practical and conceptual skills as an illustrator in the absence of formal training. Making almost no money, mind you, although it’s paid off in the long run: I’ve learned to be patient and stick with it! So it’s very important to pursue personally challenging work, and small jobs can be just as significant as high profile ones for that reason. Although people are often impressed by an association with high-profile projects (especially film) perhaps my most significant achievements are modest landscapes and portraits painted in my parents’ garage during my early twenties, work which remains unexhibited and unpublished. I still enjoy creating paintings that have no commercial concern or public dimension: I think it’s very important to have this stream of work alongside commercial practice, a separate stream – again, it’s all about strong personal development. A good artist is (I think) an eternal student, and even when most confident, never feels like a master. They are forever pottering in their backyard spaces, trying to explore their craft with modest integrity. That’s how unusual and original work emerges, not by chasing markets or fashionable movements, or wanting to be conventionally successful. Joseph Kubert (September 18, 1926 – August 12, 2012) was an American comic book artist. He is best known for his work on the DC Comics characters Sgt. Rock and Hawkman. His sons, Andy Kubert and Adam Kubert, have themselves become successful comic-book artists. Kubert’s other creations include the comic books Tor, Son of Sinbad, and Viking Prince, and, with writer Robin Moore, the comic strip Tales of the Green Beret. 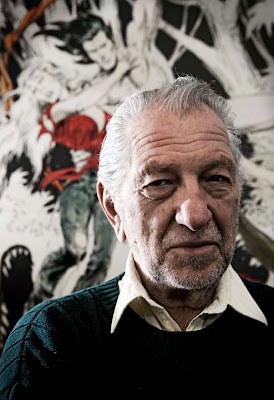 Kubert was inducted into the Harvey Awards’ Jack Kirby Hall of Fame in 1997, and Will Eisner Comic Book Hall of Fame in 1998. Kubert passed away on Sunday, August 12, 2012 in Morristown, N.J., of multiple myeloma. His eight decade legacy in comics made him a legend. A legacy he helped to pass on by founding the Kubert School, a school he founded with his wife, Muriel. Founded in 1976, the Kubert School is the nation’s only accredited trade school for comic book artists. With courses in commercial art as well as traditional sequential artwork. For more info please visit his wiki page. I am sad to have to offer my condolences as I post this Icons and Legends article. Leo and Diane Dillon easily made my list of Icons and Legends. I was saddened to learn that Leo Dillon passed away on May 26th. So I’m posting this as a tribute to him, his wife and their numerous contributions to the art world. He will be missed. 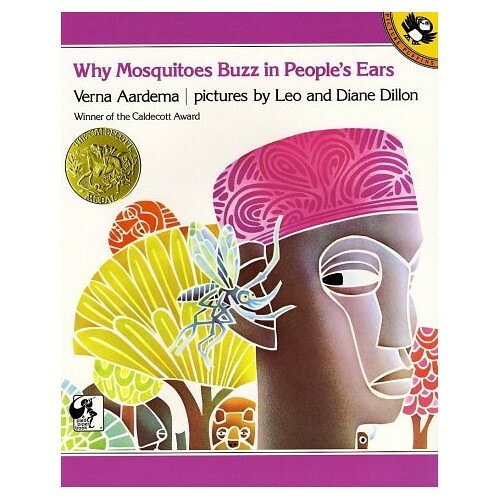 I first became familiar with the Dillon’s through their magical Caldecott award winning book, “Why Mosquitoes Buzz in People’s Ears.” Their artwork was African inspired and perfectly captured the tone and content of the book. I only wanted to learn more about them. I got the chance in college when they were the subject of Illustration History.